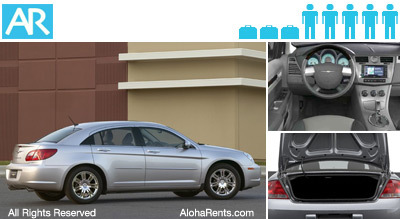 The 4-door Sebring is considered a mid-size or intermediate rental car. Although, there is ample room for 5 people and space in the trunk for luggage. Comfortable ergonomic seating and a nice sound systems help to create a luxurious environment. The average mileage for the Sebring is 23 MPG. Automatic transmission, tilt wheel, cruise control, reclining front seats, power steering, windows and brakes, 4 doors, A/C, AM/FM stereo and CD player.